Lily Alice Butler was born one of twins,on May 19th, 1878. Her parents were Alice Sophia McCoy, a Pitcairner (and midwife), and Peter Butler, an American survivor from the 'Khandeish' that was shipwrecked on Oeno in September 1875. Sadly he left his wife and their twin daughters the same year they were born and never returned. Lily's identical twin sister was Rosalind Eliza Butler who eventually married Parkin Christian. Lily fell in love with George Francis Chris Warren, a navigator and boatman who commanded several island boats, including two Pitcairn-made vessels and they were soon married. Their first son, Burley, was born on February 23rd, 1897 and there followed four more sons - Christopher, 1898 (who died in his first year); Christy,1899; Ernest,1900 and Maynard,1904. Lily learned midwifery skills from her mother Alice. 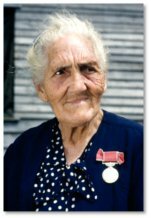 She actively helped at least two generations of islanders into this world, and would stay with the mother and baby for two weeks and look after them and do the washing and cleaning. In all those years very few babies were lost. Many recollect that she had an "instinct" for midwifery. She loved children, and used to babysit several lots of children when their parents went out to work or out on the ships. Even when Aunt Lily officially retired from midwifery, she was often heard to say," If they ask for me, I go". Besides her considerable midwifery duties, Lily was also an excellent cook. She was one of the yeast-makers, getting dried hops from people on the ships, boiling the hops and putting the liquid in bottles to ferment. On Thursday nights she would deliver to people their bottles of "balm" and they would set their bread that night, souring the bread, and on Friday morning they kneaded the bread for Sabbath to cook it in their stone ovens). From her mother she inherited deep religious and spiritual beliefs. She was, as one person noted "she es one deep Christian woman." She taught the children at Sabbath School, still fondly remembered by her audience to this day. One great-grandchild remembers her teaching him the 23rd Psalm and impressing him with her sweet Christian influence on his life. It is believed that the final time Lily attended a birth in the capacity of midwife was when her great-granddaughter Marilyn was born in 1953. 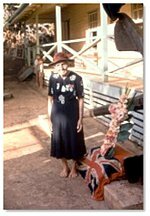 In recognition of 50 years service as midwife to the community of Pitcairn she was awarded the BEM (British Empire Medal) by Queen Elizabeth II. This was announced in the Supplement to the London Gazette, on 1 January, 1954. 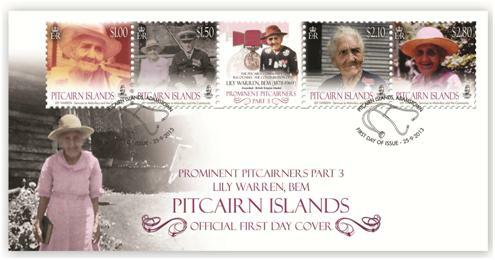 She was also mentioned in Luis Marden's 1957 National Geographic article on the Bounty and Pitcairn and her photograph from this article (wearing her medal) features in this stamp issue. Lily and George remained on Pitcairn for their whole lives. George lived beyond the age of 80 and died on September 2nd, 1959. One decade later, on September 17th, 1969, Lily joined him. Acknowledgement: Text adapted from Dem Tull article by Timothy Young. Apology: Due to difficulty with sourcing quality images the issue release has been delayed one week from the previously indicated date of 18 September, 2013.